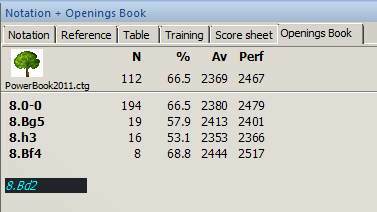 Fritz Powerbook has a number of different uses: it can be an expanded opening book for the Fritz family of playing programs, it can be a statistical tool for researching openings, it can be used for finding opening transpositions. Yet another interesting use for Powerbook is to find the spots in your own games where you or your opponent departed from “known” opening practice. I dug way back in ye old archives to select a game from about a dozen years ago. After looking at this game, I remembered my thoughts as I was playing it. We’d both started with our kingside Knights and sort of “backed into” a King’s Indian Defense. I wondered then, and still wonder now, how far along the game progressed according to “book” lines. This is the point at which either you or your opponent played a “non-book” move, generally the point at which your game has departed from known opening theory. In the illustration above, we see that my opponent was the first to leave “book” when she played 8.Bd2. However, it’s often worthwhile to play a few more moves ahead; sometimes your game transposes back into known territory. You’ll know this has happened if you suddenly see a highlighted move with statistical information to the right of its listing in Powerbook. But if your game doesn’t transpose back into known lines, move backward through the game (using the left cursor key or the “left arrow” VCR button) to return to the move at which one player departed from book. There’s a reason why we’re doing this. We can actually annotate our own games “on the fly” by using our Fritz Powerbook. 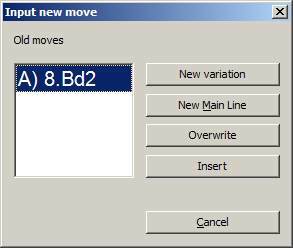 …and you’ll see that the moves have been added to your game as a replayable variation. If you want to save this variation into the game, go to the Application menu (the round button in the screen’s upper left hand corner), and select “Save”, then “Replace” from the submenu. I’m a big fan of manually stepping through Fritz Powerbook to see where opening deviations appear in games. You can learn a lot about the openings in this manner; for example, you’ll also be able to see which of your “book” moves weren’t necessarily the most popular or most effective choice. I have a question regarding the Fritz Powerbook. I have been thinking of getting it but if I can put together opening books on each opening from the Big Database 2010 do I really need the powerbook? I also have a subscription to the Hiarcs opening book that gets updated every 3 months or so. I am just curious. And thanks for all of your earlier tutorials. 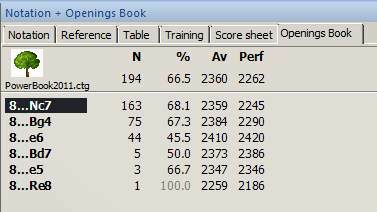 As I said above, I was slow to appreciate Chessbase but I can’t imagine studying chess without it!! With Powerbook, you get two separate books. One is composed of all current opening theory with the bad or “junk” moves weeded out manually — which is the big plus of owning Powerbook. Bad moves from U12 world championships and the like, even though they’re part of the corpus of chess history and thus will appear in “the historical record” (e.g. Big and Mega Database) have been removed. 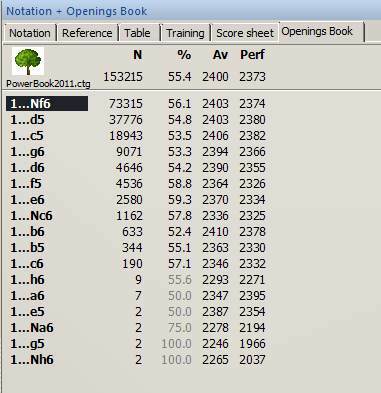 The other book on the Powerbook DVD is a subset taken from master & GM play. 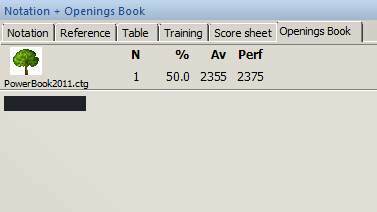 Individual opening books are great for practicing specific openings (I make them myself all the time, especially for statistical analysis). I like (and use) Powerbook, too, because when you start a game with one of the Powerbook opening libraries loaded you never know what the computer will throw at you (just like the situation in actual tournament play). 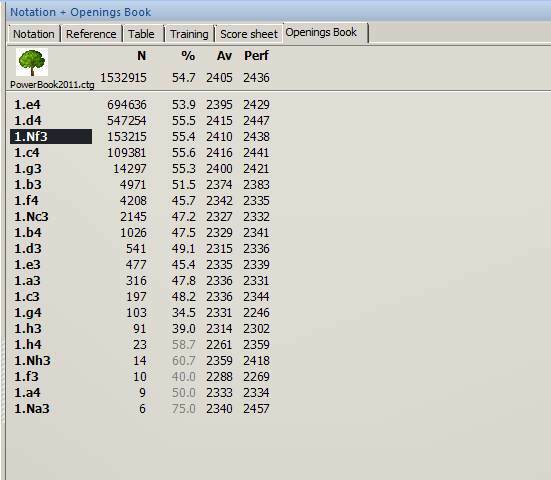 The Hiarcs book is designed to be used with Hiarcs to optimize that chess engine’s play (just as the case with the Rybka book), so it won’t necessarily reflect the range of openings you’ll find in human tournament play, just the openings which will maximize the specific engine’s chances. Thanks for writing! I’m glad that you’re finding ChessBase useful (and I’m happy that I could help).